It was raining heavily at 4:30 am in Manali. Bunty, the driver of our hired Innova warned us to be up and ready very early as the journey to Kaza was going to be long and arduous. 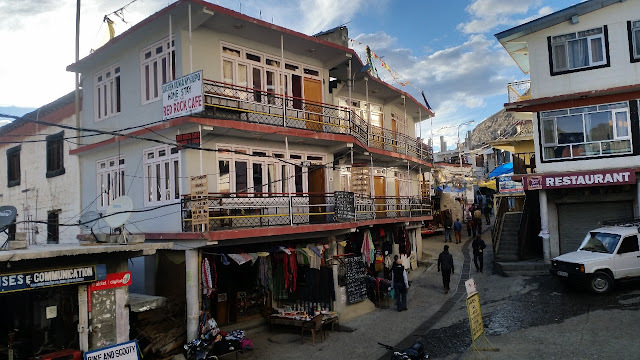 We had arrived Manali the day before by road from Chandigarh and were quite tired, but our enthusiasm got the better of it, and we were ready in the wee hours of the morning. Yes, we were going to Spiti Valley. 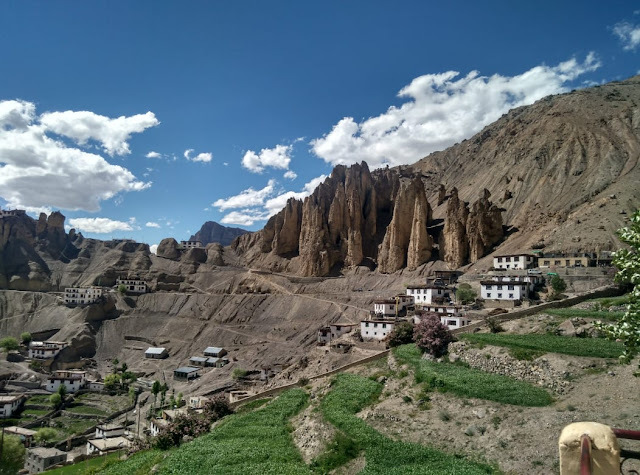 After months of discussion and planning the itinerary, here there were four of us looking forward to this part of Himachal which is often bypassed in favour of Kinnaur or Ladakh. The serene valley located between Kunjum Pass and Kinnaur region of Himachal presents some extraordinary views that you can ever hope for. From Manali in Kulu Valley, the road past Rohtang Pass to Spiti is initially the same as that to Ladakh. 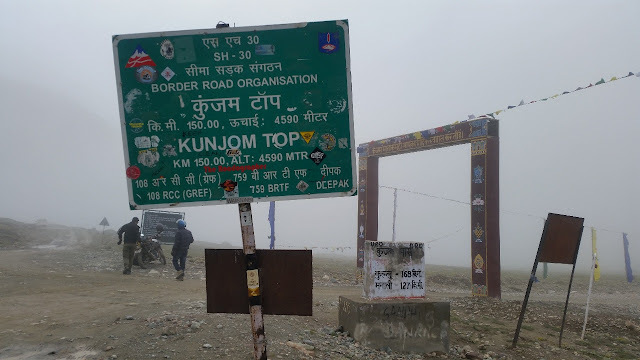 At a height of more than 13000 feet, the roads after Rohtang are notoriously bad and are closed for snow till early June, and again after October. Rohtang is 50 km from Manali, and the road till Marhi, a tea stop 15 km before is still decent. 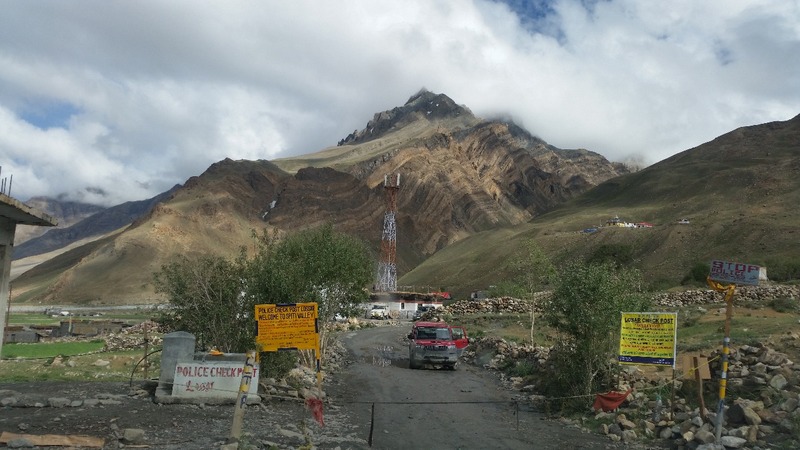 Marhi is the place where we had to say bye-bye to our Airtel connection, the stretch till Spiti has only BSNL signal, that too only in three or four places. 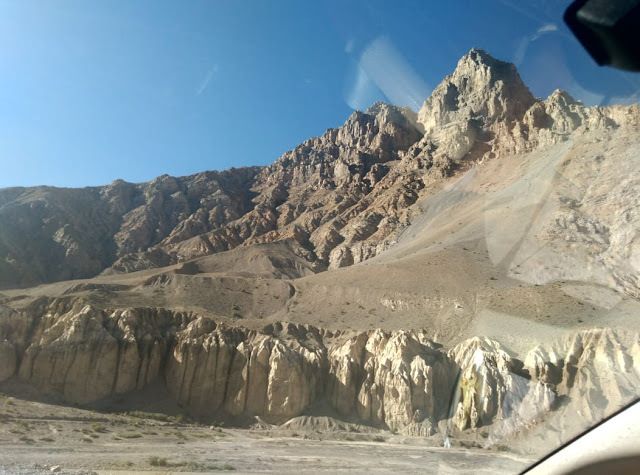 The terrain starts becoming rocky after Marhi, and deteriorates especially post-Rohtang at Gramphu where the roads to Ladakh and Spiti separate. 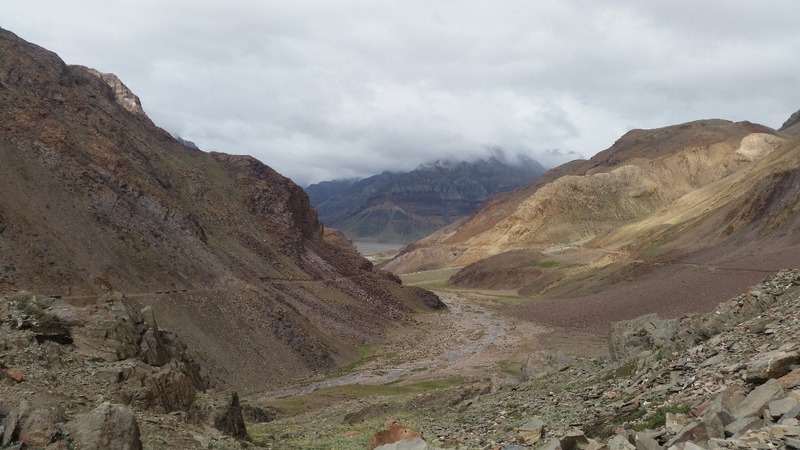 As you cross Gramphu, you have the Chandrabhaga (or Chenab) river for your company. 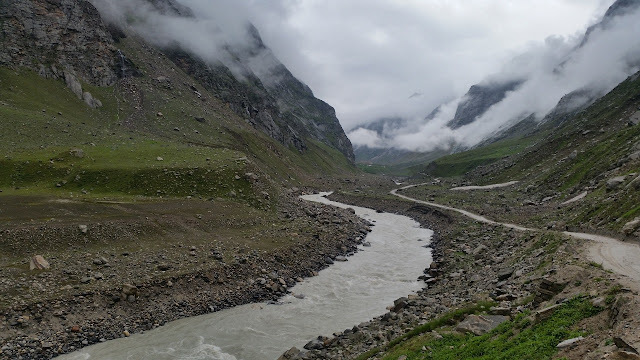 The river originates somewhere near Chandratal and travels down Lahaul to Kashmir. We were travelling in a Toyota Innova, and the car had major difficulties on the terrain. 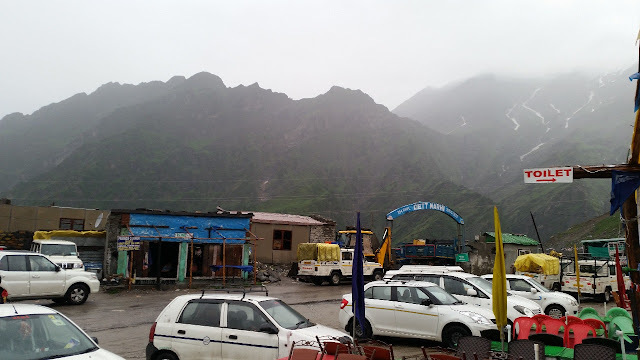 After a stop at Chatru, a small village which had some basic breakfast like parathas and Maggi available in a tent, our journey continued towards Batal. As we climbed, the weather became quite chilly. 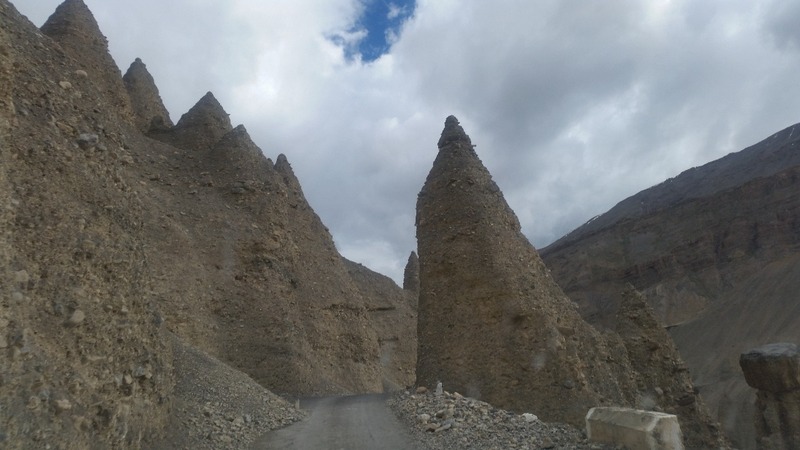 Between Chatru and Batal lies the worst stretch of the road of the entire journey. At places, rivulets from nearby springs cross the roads which by now had only stones. It was almost like driving on a dry riverbed. The cars failed to go across with the passengers and the luggage. So, all of us had to get down and cross the water so that our empty vehicle had enough power to do so. We have travelled to Leh from Manali, and to Gurudongmar Lake in Sikkim, but this stretch en route Spiti is one of the worst I have seen. After Batal, the road climbs up to Kunjum Pass, the pass which separates Lahaul and is the gateway to Spiti. 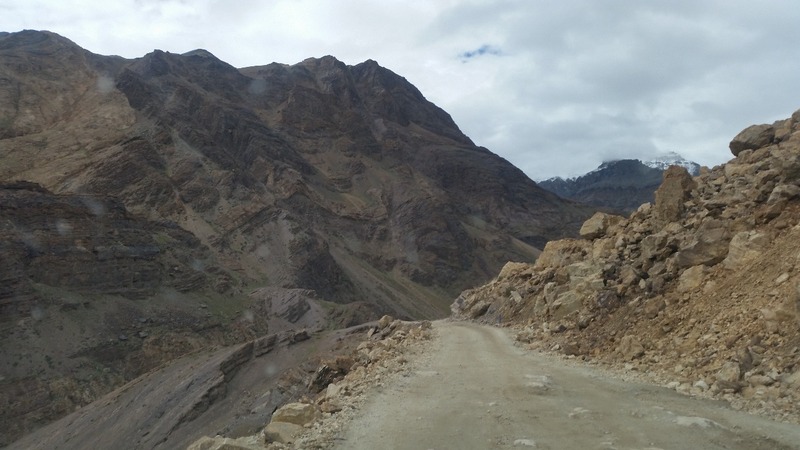 A road on the left bifurcates to the Chandratal Lake, which is best visited on your return due to the high altitude and need for acclimatization. 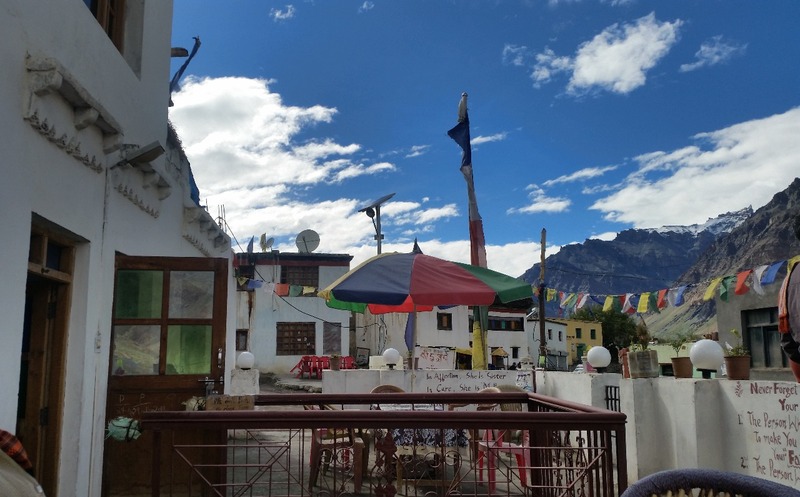 Around noon, we reached the Kunjum Devi temple at a height of 15,000 feet. 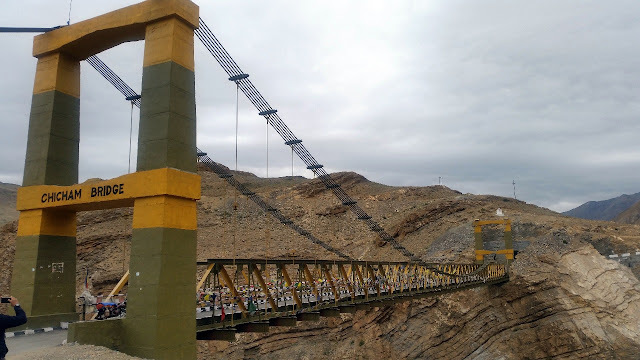 Just like any other mountain passes, Kunjum La has very basic facilities. It was raining intermittently and the cloud cover brought down the temperature further. We were hungry, but could not find even basic food at this point. Bunty, our driver told us that the nearest village to get food would be Losar, the first hamlet after you enter into Spiti Valley. So, after the customary pics at Kunjum, we headed there. Losar is the first place after Rohtang, where you get BSNL mobile signal. 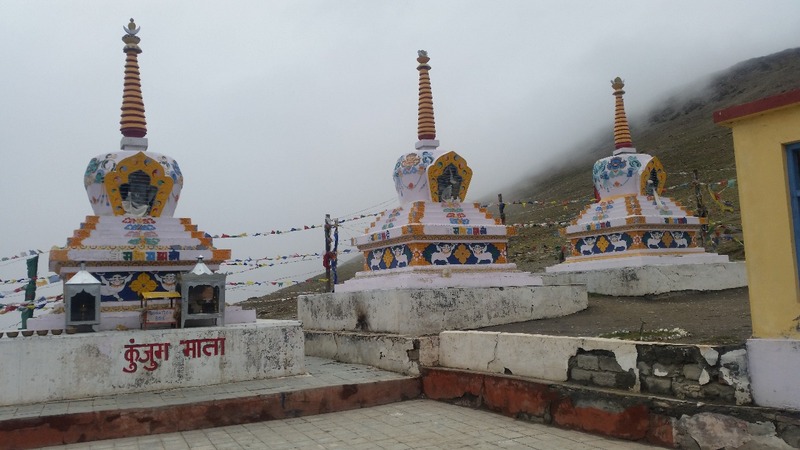 Located at a height of 12000 feet, it has a population of 250 people. 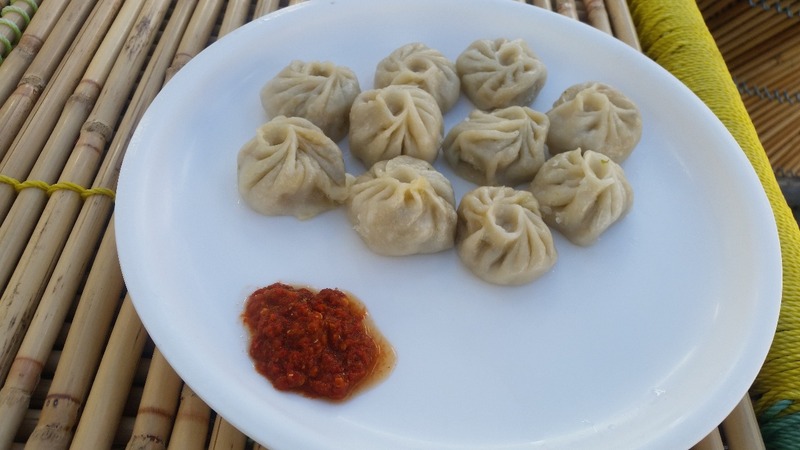 We had our first taste of Spiti food at a café here – Thenthuk - from flat handmade noodles and some vegetarian momos. 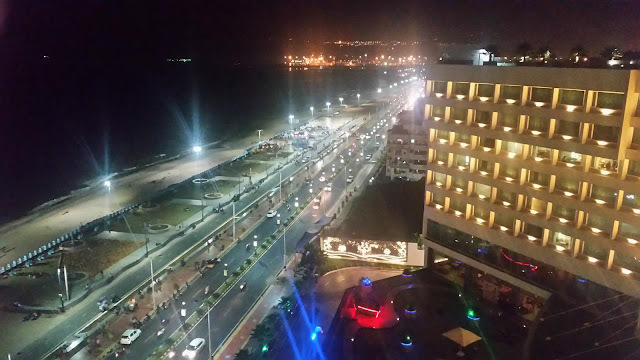 Here is the place from where the beauty of the valley starts unfolding. The mountains start changing colour, it is now much more barren and grey or brown in colour in this high altitude desert. The blue sky adds to the landscape, with white cloud throwing up reflections on the mountain tops. 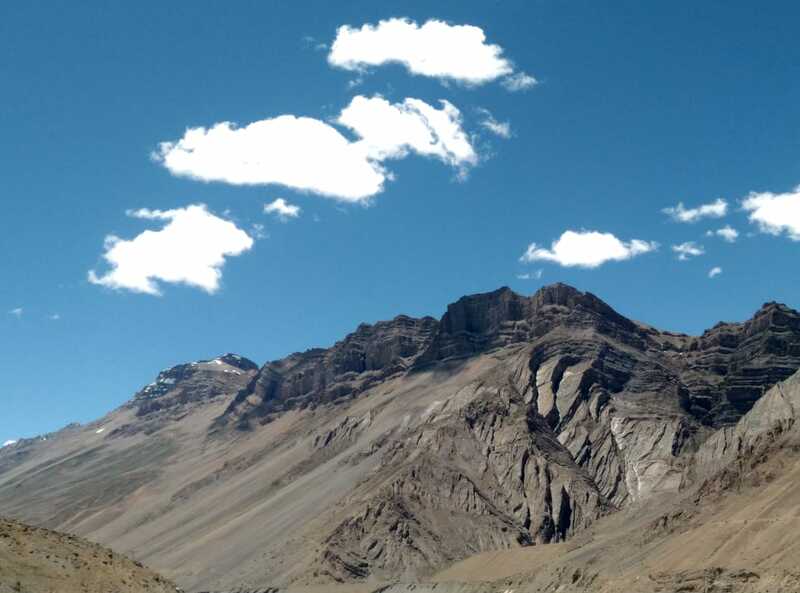 What I realized was that the towering high ranges of Spiti are not as colourful as the desert of Ladakh. 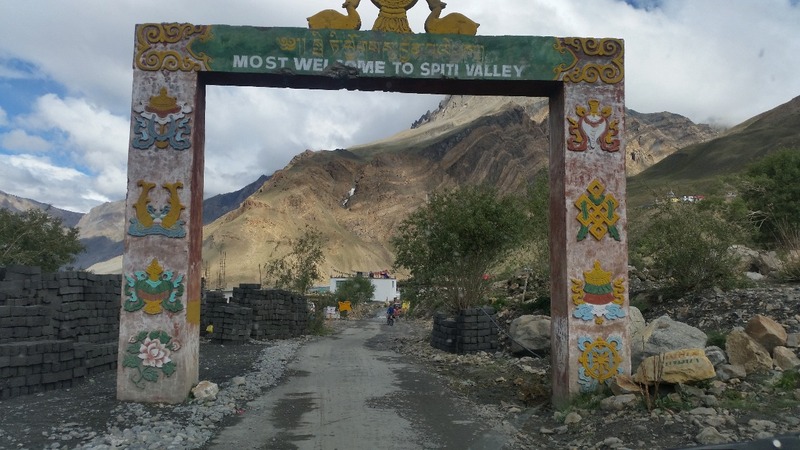 Spiti, which means “the middle land” gets its name as the area between India and Tibet. 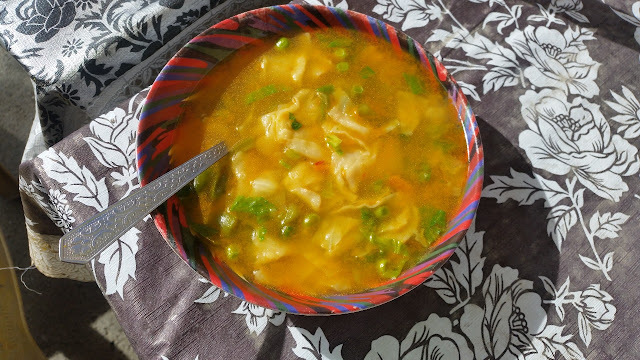 Kaza is about 80 kilometers from Losar. The roads become much better here. 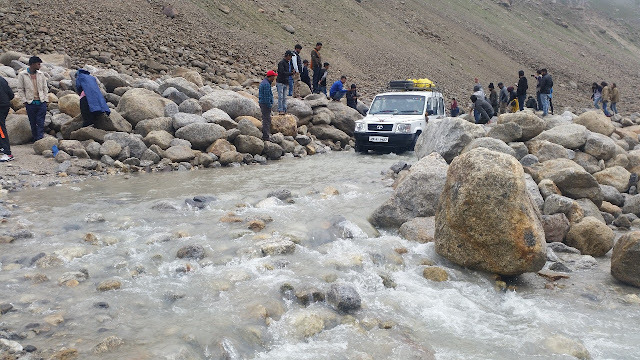 By now, Chandrabhaga has taken our leave, and the Spiti river has joined us on the side of the road. We travel through Pangmo, cross a scenic bridge near Chicham and head into Kibber village. The houses are made of mud brick and all are whitewashed to provide a set pattern in any village in Spiti. Few kilometers away after passing the Ki Monastery on our right is Kaza, the headquarters of Spiti Valley, and one of the very few towns in the area. 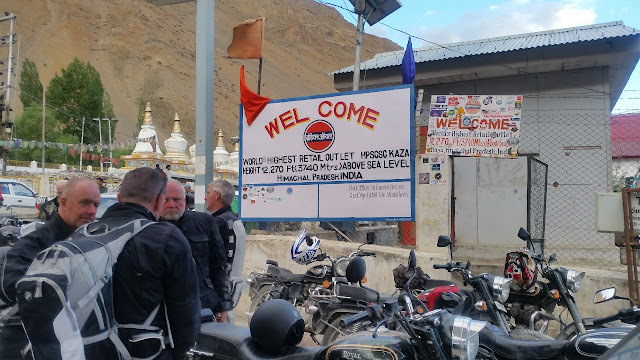 The only petrol station of the valley is located at Kaza. Our driver tells us that due to short supply often fuel is rationed here. The town market looks sleepy with a small market, and a clean monastery. 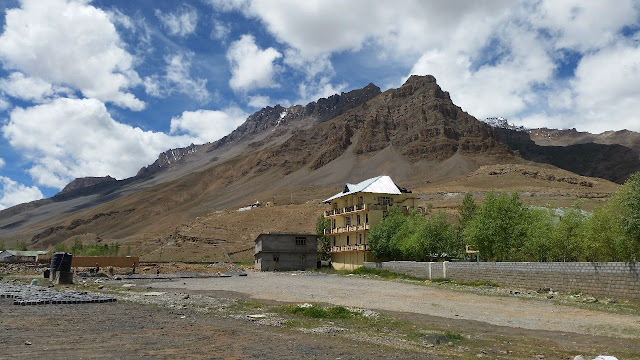 Our final destination is Rangrik, a village close by where we would spend the night at Hotel Spiti Serai, a scenic area with a 360 degree view of mountains. We checked into the hotel and retired early, as over the next three days we would have a hectic schedule of exploring the villages of Spiti and the lifestyle of the local people.